​Please enjoy our "19th Century Collection" of American and European paintings that were executed between 1830 and 1930. This unique collection was curated over a thirty year period by the owners Bob & Sheila Keller. 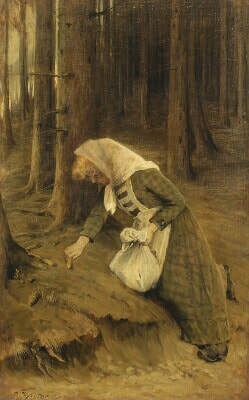 The Kellers often travel across America and throughout Europe to meet with local gallery owners, collectors, pickers, auction houses, and private estate brokers to gain "first to market" status for works that have been hanging on the same walls where they were placed in the mid to late 1800s through early 1900s. With that said, our mission is to search out the best of the best art available on planet earth....purchase them from reputable sources, have them crated and shipped to our Pittsburgh, PA location, and then prepared for exhibition by our formidable art conservation and restoration studio. After extensive research, paintings are evaluated and assigned a fair wholesale price for resale to galleries, designers, collectors and enthusiasts. We also offer individual works from our collections to the retail trade through our physical gallery located at 8275 Ohio River Boulevard in Pittsburgh, PA. 15202. Many of the paintings housed in the Eclectic Art Gallery collections are centuries old and may have been stowed away in an attic, or barn loft after one of the world wars while others were sold off the walls of an old castle or French chateau, while others may have been found at ArtEXPO NY, Chicago, or LA, or in tiny art fairs, estate sales, street markets, or from a little art gallery in Bermondsey Square on Tower Bridge Road in London or the famous market...“Le Marché aux Puces de Saint Ouen” (Porte de Clignancourt Paris). But, regardless of their provenance, or where we find them, they are all masterpieces that need to be saved, respected, and given a place of honor as part of our cultural legacy! ​Oil on Board 28" x 18"
​Bertha Wegmann was invited to exhibit her paintings at the 1893 Columbian Exhibition in Chicago along with Mary Cassatt and other notable women painters from America and Europe after receiving considerable recognition in Denmark and in Europe for her portraits and genre subjects. During her career she became the first female member of the Royal Academy Council in Copenhagen. 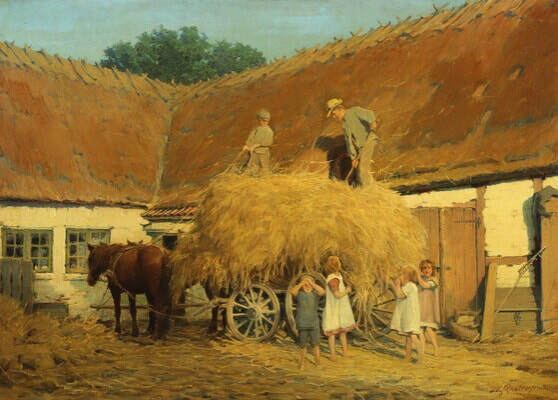 Wegmann also worked actively to get women admitted to the Danish Royal Academy of Art which was eventually accomplished in 1888. From 1881 on, she lived and exhibited in Paris. Robert Lindneux travelled to Europe from his home in New York to attend the Art Academy in Dusseldorf, Germany and later the Ecole des Beaux Arts in Paris, France; and the Munich Academy. But, his future was cast after a chance viewing of the Buffalo Bill Wild West Show that drove the artist to settle in Colorado where he worked as a trapper, horse wrangler and cowboy in order to experience the life that he so expertly painted. During his long and prosperous career Lindneux collaborated with his friend Charles Russell on color, composition and the many nuances of the painted image and eventually painted the life sized portrait of Buffalo Bill Cody, as well as the famous "Trail of Tears" painting and a vast collection of significant historical works including the Sand Creek Massacre painting that is housed at the Colorado History Museum. audition up to twenty original museum level paintings in the privacy of your home, office or other venue of choice. ​and business associates for a house/office party, or other special event. we will quote prices for individual works if asked. However, all paintings will be available for purchase. on all artwork purchases made during the personal art audition or group event.